Grant McCann has called on his Doncaster Rovers players to power into a potentially pivotal Easter weekend by picking up a fourth consecutive win on Saturday. Rovers host Plymouth Argyle on Saturday, looking to at the very least maintain their five point cushion inside League One's top six. The clash at the Keepmoat comes ahead of the Good Friday trip to automatic promotion chasing Sunderland - and McCann is keen for confidence to be high heading to the north east. "We want to make sure we go to Sunderland with another win and that we enjoy the game," he said. "Enjoy it but go and try to get a result. I don't mean go there and get the flip flops out. "It's important we win our home games and I've stressed that this year, the homes games are massive. "If you have good home form then you can put yourself in a very good position in the league, and we've done that. "This is an important game for us, probably the most important game of the season now. "And we have to make sure we produce a good performance. "The boys are in a really confident mood with smiles on their faces." The trip to Sunderland is followed by a home game against Accrington Stanley on Tuesday, April 23, after which Rovers will have only two games of the season remaining. McCann has been understandably delighted by Rovers' recent form and is determined for the momentum to continue to grow when they host Plymouth on Saturday, but warns it will not be easy. "We have to continue to do what we're doing," he said. "We've got to follow it up now against a Plymouth team that can hurt us. "If we play like we did against Bradford they can hurt us. We're mindful of that. 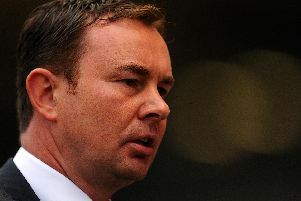 "Derek Adams' teams are always hard to play against and their front three can cause you problems. "We have to defend strongly and defend one v one at times because they put you in that position."